The development of prior authorization (PA) programs was intended to promote appropriate, cost-effective healthcare. However, an unintended consequence seems to be that access to critical laboratory services used in the prevention, diagnosis and management of disease may be curtailed or even prevented. A successful prior authorization strategy has become an increasingly important factor in the health of a clinical laboratory’s cash flow. Uncertainty around patient financial responsibility, long approval processes, delays in patient care and strained provider relationships are causing some labs to experience a decrease in test volumes -- impacting their financial success. 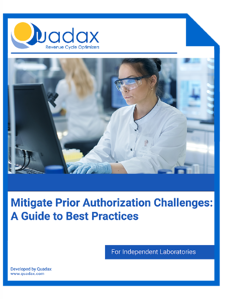 Quadax, a provider of revenue cycle services to the clinical laboratory market for over 20 years, understands that failure to comply with PA will increase the likelihood of a claim being denied for payment and the patient paying for the service out of pocket.